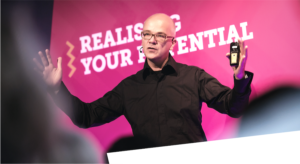 I have created an online Marketing Leadership Masterclass that starts in April 2019 in association with Marketing Week. Sign up by March 15 for a special reader discount (you’ll save GBP 250). Successful marketers and agency leaders aren’t born. They’re made. The Marketing Leadership Masterclass isn’t about marketing. It’s about becoming a leader who inspires change, builds influence inside the firm, mobilizes colleagues and leads teams. You choose your own pace in this 12-week, 100-percent online class. Build your personal leadership plan with a workbook, readings, reflection papers, live Q&A sessions with me and a signed 12 Powers of a Marketing Leader book. Over 1,000 people have attended my 12 Powers live classes. The results? More impact, more career success, and, quite simply, more fun. Together with a BBC journalist and a great director, we’ve worked for months to bring these leadership lessons to marketers. (I’m going to miss my makeup artist). Click here to book now. Use discount code “friendsoftom” but please, keep it to yourself. You’ll have to hurry. The code expires March 15. I’ve got good news. Until December 1st, our publisher, McGraw-Hill and 800-CEO-READ offer a 40% bulk discount for our marketing leadership book The 12 Powers of a Marketing Leader. Here’s the deal: for 25+ books, it’s 40% off. Want to train your team? Now’s the time! You can combine this with our 100-Marketers Challenge. Need to organize your season’s mailing? 800-CEO-READ will even do it all for you (contact andrew@800ceoread.com). They’ll limit this offer until end December 2018, so order today! To bring the insights from the world’s largest ever study on marketing leadership to 1,500 marketers at all levels, Thomas and Patrick are giving away two hours of free team learning to 15 marketing teams in 2018 and 2019. Places are limited! 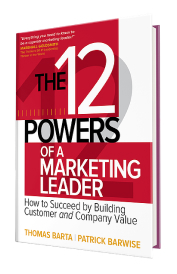 The session is free for every team leader who buys at least 100 copies of The 12 Powers of a Marketing Leader. Where’s the catch? There’s none. Thomas and Patrick don’t run consultancies. It’s all about spreading the word to marketers across the globe. Simply contact Thomas and register your interest. 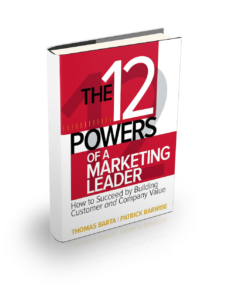 Buy 100 or more copies of The 12 Powers of a Marketing Leader from any source of your choice—and send us a confirmation copy. Agree a convenient date for the session. Any questions? Please read the FAQ-section at the end of the post. The 100-Marketers Challenge is limited to 15 teams in 2018 and 2019. Q: Do I need to have a 100-strong team to participate? A: No. You can choose to give to give the spare books to other marketers and colleagues outside your team. Q: Which topics will you cover? A: We’ll cover the basics of marketing leadership with a focus on leading upwards (shaping the agenda) and sideways (mobilizing colleagues). Q: Can we do this session for our clients too? A: No, this free program is for internal teams only. Q: Will the session focus on the specifics of our company? A: The principles of marketing leadership are universal. The company specifics will then come through the questions and discussion during the two sessions. Q: Do you offer follow up sessions and programs? A: If you believe, after the session, deepening the content would make for significant impact within your team, Thomas will be happy to discuss options with you. Q: How will you organize the sessions–technically? A: Thomas and Paddy will moderate the session and provide short pre-session exercises for your team. All you have to do is manage the invitations on your end and host the session, using your preferred company voice or video conferencing system. Q: What are the exact steps we need to take after confirming? Purchase 100 or more 12 Powers books and send us the confirmation. Once your team members have the book, and 2 weeks ahead of the session, Thomas or Paddy will send you a suggested email for your team, detailing the session-content and a suggested pre-reading. After the session, Thomas or Paddy will follow up with an email and further suggested exercises for your team. “I only wish I had been able to read it a good few years ago! Do You Know Talented Young US Marketers? The future of marketing depends on its people. Nominations are now open for the first US-based Marketing Academy Scholarship–the program that brings together CEO’s, CMO’s, authors, experts, inspirational speakers, founders of charities and sporting legends to contribute to the curriculum on a pro-bono basis, ensuring the Scholarship is a totally unique and immensely powerful learning experience. After having taken Europe and Australia by storm, Sherilyn and the team are finally putting on a US program. But hurry: nominations close Sep 07. The London marketing conference is coming. Join me on October 10 and 11 for the Festival Of Marketing (more interestingly you’ll also get diver Tom Daley, Byron Sharp, and Steve Wozniak).